When you have a skin that is oily and at the same time dry at some parts, then it means that you have a combination skin. When you have combination skin, you will notice that your forehead, nose and the chin area tend to be oily. Other parts of your face remain normal or dry. How to Identify Whether You Have Combination Skin? The best way to check whether you have combination skin is to place a tissue paper on your face. It there is oily area on the tissue paper in the shape of the letter ‘T’, it means that you have combination skin. Your T-zone area is the area consisting or your forehead, nose and the chin. Put the tissue paper on your face two hours after you have washed your face. Remember not to apply any makeup on your face before testing the skin with tissue paper. This way you will get the correct result. There are various reasons why some people have combination skin. In some it may be hereditary. It can also be due to hormonal activities. 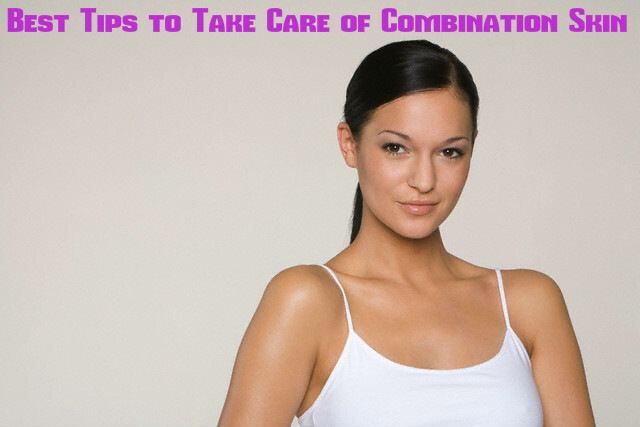 Here are some tips that will help you to take care of your combination skin and how to deal with certain issues related with combination skin. You hands contain a lot of germs as most of the activities are done with hands. So, it is better not to touch your face often with your hands. Do not pick or squeeze your skin. This can cause the open pores to enlarge in size and as a result, the oil glands will start secreting more oil. This leads to more skin problems. Exfoliation is very important for all types of skin. It helps in getting rid of blackheads, whiteheads and dead skin cells. It gives a good polish to your skin and increases the flow of blood in the skin. Exfoliation is also great for opening the pores of your skin. This allows the skin to breathe properly and to absorb all the nutrients and vitamins from face packs and masks, CTM and night cream. Make sure that you follow the CTM routine, which means Cleansing, Toning and Moisturizing. This way you are sure to get a flawless skin within a short time. It removes all dirt and grease from your skin, provides it an even tone and prevents all problems of your skin. Note: It is good to follow the CTM routine during the evening instead of on the day and remember CTM shouldn’t be followed more than 2 times in a day. You can use face packs and masks twice every week. You get a variety of face packs and masks in the market and choose one according to your skin type. They are readymade and easy to use. However, sometimes it is good to use homemade DIY face packs. They are made with natural and fresh ingredients, which help giving a boost to the health of your skin. Home remedies for combination skin is often found to be more effective than the readymade packs that you get in the market. Toner is an important part when you take care of your skin. This is particularly important when you have combination or oily skin. Toner helps in balancing your skin by getting rid of all traces of cleanser from the skin. It is also good for shrinking the open pores of the skin. Choose the correct moisturizer and apply it on your skin. It must be such that it moisturizes the dry area and mattifies the oily parts on your face. You can choose a gel-based moisturizer or a gel-cream moisturizer for combination skin. By using a night cream when you go to bed, you can improve the texture of your skin and get added benefits. It helps in repairing the damaged skin if any, and also keeps your skin well moisturized. By leaving it overnight, your skin will absorb all the vitamins from the skin and this will give a natural glow to your skin when you get up in the morning. Night cream also works as a good anti-aging agent and delays signs of aging like appearance of wrinkles, fine lines, pigmentations, age spots and so on. Try to avoid using soaps to cleanse your face as the skin on your face is very delicate and gets easily affected. Soaps can make your skin dry and can also cause irritations. This may aggravate the problems of your skin. Use a mild and gentle cleanser on your face. You can choose one that suits the type of your skin. You may also use natural cleansers like honey, milk etc to clean your skin. Never forget to apply a good sunscreen on your face. It protects your skin from the UV rays of the sun when you go out. When you buy sunscreen, get one that suits your skin type. Check the product well before you buy it. Go for sunscreen which has both UVA and UVB protection. Apply it 20 minutes before you go out. This way it will be more effective. When you are outside, dirt, dust and grime may accumulate on your skin. So, it is important that you cleanse your skin well after coming home. Before you go to sleep at night, make sure that you cleanse your face and remove all traces of makeup from your face. No trace of makeup should remain on your skin for the whole night as it can cause allergies and breakout. You can follow the CTM procedure. By following these tips you can solve your problems to a large extent. It is also important that you find out the cause of your problem and do what is needed. Have a healthy and well balanced food and drink lots of water. You can also have fruit juices and vegetable soups. Proper exercise is also good for a healthy skin. If you cannot go to a gym, a brisk walk will do. Whenever you go out, carry with you tissues or blotting papers. Always use products that are made for combination skin.